10. Distressed property: Too much debt and too many layoffs pushed many homeowners to the financial brink. Owners rushed to sell as bankers hit the market with their repossessed properties. In June 2007, 13 percent of homes sales were either short sales — banks agreeing to take less than owed — or sales of foreclosed properties. That distressed share of selling would become roughly half of the market during the next five years. But by June 2017, that share settled back to just 7 percent. Fortunately, it’s only a history lesson today. The supply of foreclosures to buy has shrunk from 463 in late June a decade ago to only 27 as this year’s summer began. 11: Warning signs: Nothing screams “danger” more than owners skipping house payments. Ponder what lenders were doing in June 2007 vs. this past June. Default notices, a first step in foreclosure: 1,144 then, 310 today. Auction notices, the official threat to sell: 598 then, 213 today. Actual foreclosures: 281 then (and 1,084 in June 2008) vs. 21 today. For the bubble to ‘pop’, and prices decline, we would need more than a trickle of distressed sellers who need to sell at whatever price the market would bear. A rash of boomer liquidations might happen, but with reverse mortgages being available, they have other options too. The foreclosure rate of loans originated over the last few years has been LOW! If the strict underwriting continues, we will only see an occasional foreclosure from now on. We’ll be telling our grandkids about how back in the day there was this guy who ran a video-cam through hundreds of them! The dip in total filings was due to a 10 percent reduction in bank repossessions or completed foreclosures compared to October. A total of 25,249 properties were taken into bank inventories or REO, down 17 percent from November 2013. It was the 24th consecutive month in which completed foreclosures were lower on a year-over-year basis. Regardless of how it happened, it looks like a soft landing that will last – at least as long as rates are ultra-low. Reader elbarcosr noted that the latest default list was the longest in recent memory, and wondered if the foreclosure market might be coming back to life. If the NAR would have been looking out for realtors, they would have insisted that the foreclosure process be allowed to run its course, and clear the market. Instead, they lobbied for foreclosure-rescue programs from the government, and now we have a mushy unknown distressed market – again. It never closed escrow, and has never been on the MLS – instead, it’s another bank-owned property sent to foreclosure purgatory. Auction.com is also known for conducting price discovery for NationStar on their short sales. Auction.com will market the home and conduct online bidding even though the seller has a written contract with a buyer. Nationstar has a right to sell their short sales for top dollar, and this process helps to expose any shady dealings by the listing agent, but it doesn’t help the reputation of Auction.com. Though auction.com is the most visible player in the foreclosure market, we can’t judge the trend by their advertising. What matters most is whether the lenders and servicers are going to liquidate any remaining defaulted properties, especially now that prices are up? I’ll be on flood watch! “We have now registered two and a half years of continuous decreases in the number of homeowners who are in some stage of the foreclosure process. This consistent decline means fewer Americans are experiencing the distress of delinquency and default,” said Anand Nallathambi, president and CEO of CoreLogic. 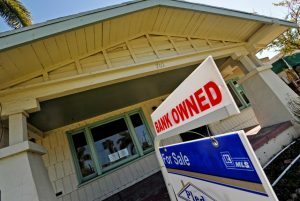 The foreclosure notices and the number of properties actually foreclosed have dropped considerably in San Diego County. We have had 1,500 to 2,207 notices sent out per quarter over the last 12 months, but only 450-610 properties foreclosed per quarter. The big gap makes you think that the banks/servicers are still throwing loan mods at anyone who wants one, and cancelling any notices soon thereafter. Distressed sales have dwindled down to a fraction of the NSDCC market, though they were never a large contributor. There are only 9 active listings of short sales (out of 1,030 total active listings), 29 are marked as contingent currently, plus 4 active listings of REOs. Should the feds decide to not extend the relief from debt tax past 12/31/13, it should be the final straw and end short sales altogether around here. For buyers, the hope of getting a deal should be fully extinguished, and just trying to find something suitable for a decent price is a major challenge. Hopefully this embarassing chapter in realtor history will be over soon. We’ve already had 1,504 properties get foreclosed in the first half of 2013, so historically we’re still at elevated levels. But with the county averaging 3,000+ total sales per month, lenders will be able to sprinkle in a couple of hundred REOs each month without affecting values much. In addition, flippers will keep doing their share; selling a similar amount of properties for retail-plus. In some cases banks are choosing to hold onto distressed assets longer, hoping to minimize losses on homes by artificially tamping down distressed inventory levels now. So when a home comes available in a foreclosure sale, the lender may choose to repossess it as a future REO than part with it during an auction. In states like Arizona, that repossession is logged at the value of the mortgage — a “sales price” that may very well be higher than the actual market value of the property, according to Ingo Wizner, president of real estate research firm Local Market Monitor. Regardless whether the shortage of distressed properties is due to more borrowers now making their payments, increased legislature, or a deliberate shift in banking policy, the foreclosure spigot has slowed to a trickle.